Video clip synopsis – Trevor Barr talks about independent media and behind the scenes at Radio Redfern as another show goes to air. Broadband MP4 radioredfern_bb.mp4 (14.0MB), suitable for iPods and computer downloads. Radio Redfern is an excerpt from the film 88.9 Radio Redfern, produced in 1988 by the Film Australia National Interest Program. 88.9 Radio Redfern is a portrait of Sydney’s Aboriginal radio station. This video clip is on the From Wireless to Web website, produced in 2005. The interview with Trevor Barr was recorded for the website. conduct, record and edit a radio interview. Reading Standard: students view, analyse, critique, reflect on and discuss contemporary and classical imaginative texts that explore personal, social, cultural and political issues of significance to their own lives. They compare and contrast the typical features of particular texts and synthesise information from different texts to draw conclusions. Writing Standard: students write sustained and cohesive narratives that experiment with different techniques and show attention to chronology, characterisation, consistent point of view and development of a resolution. They write persuasive texts that support the presentation of different perspectives on complex themes and issues. They proofread and edit their own writing for accuracy, consistency and clarity. Community broadcasting promotes active volunteer participation in media production rather than passive consumption of media. The sector provides skills and training that ensures access to the media for all parts of the community. Community broadcasting fosters innovation, creativity and diversity of content. In both structure and output, community media reflects Australia’s immense cultural diversity and by doing so supports greater tolerance, understanding and social cohesion. Community media has an expanding local role. While commercial media and the ABC are reducing local content and increasing networking, community stations have become the voice of local communities. Comment on the benefits and advantages of community radio. 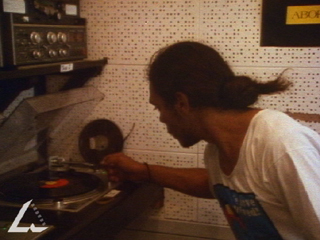 What clues are there, from the contents of the archival video clip, that Radio Redfern is a community radio station rather than a mainstream commercial or ABC station? Comment on your own familiarity with listening to, being involved in, or knowing someone involved in, community radio broadcasting. In pairs, research the community radio stations in your listening area, then, drawing on your research where necessary, prepare an illustrated double-page magazine article aimed at young teenage readers about the purpose and benefits of community radio broadcasting. A new community radio licence is to be made available. Research, plan, draft, edit and proofread a written submission of 300 words to the Australian Communications and Media Authority arguing why a group you represent should be granted an operating licence. The group may be community health, non-English migrant groups, conservation and environment, or one decided upon in discussion with your teacher. Imagine a school radio program where an announcer interviews students about their hobbies or special interests. In pairs, plan, and record a sound file of an interview. The completed version should be five minutes long — you will need to edit your sound file for length, quality and audience interest, which means deciding what to leave out. Reverse the roles of interviewer-interviewee and repeat the process. If possible, place the interviews on your school’s intranet for playback.